Kate Middleton's grandfather worked here as a solicitor. Description: This is where Richard Noel Middleton, Kate Middleton's paternal great-grandfather was listed as working as a solicitor. At the time however this address was a private member's club - The Albemarle Club. Perhaps he used this address and practised from his main office in Leeds. Kate's family on her mother's side come from working-class roots in Yorkshire and the Durham coalfields, her father's family background amid the mercantile wealth of Leeds. The Albemarle Club relocated before the 2nd world war, and now the site is a restaurant. 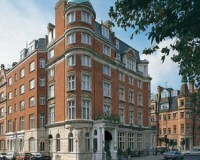 The London hotel where Oscar Wilde was arrested.